The famous Andaman and Nicobar Islands is one of the 7 union territories of India with Port Blair as its capital. The group of roughly 300 Islands is a travel and settlement destination for many nature lovers and loners. Formerly colonized by Danish and the British Raj, it is also the host of the only command service of the Indian Armed Force, ‘The Andaman and Nicobar Command’. Your dreams to settle in the Islands can be fulfilled by renting a place and getting a Rental Agreement. You can even get an Island on lease here. Before renting a property the owner must give the tenant the permission to use or settle on his property. So the permission to let the tenant use the property is legally granted with the help of a formal contract signed by both tenant and the owner called Rental Agreement. The rent agreement is signed in order to address the interests of both the parties and to avoid legal disputes in the future. But, before signing the agreement make it clear to yourself how a Rental Agreement is drafted. How To Complete Your Rental Agreement? To create a Rental Agreement and finalize it, there are procedures to be followed. First of all, in the form of the Rental Agreement, fill in all the details asked in the website. After you complete filling in, your details will be reviewed and then you shall make the payment. The soft copy of the draft will be available for download once you have cleared the payments. You shall then print the downloaded draft of the Rental Agreement on a stamp paper of due value. Include everything that has to be agreed upon like advance payment, security deposit etc. in it. Then, the agreement has to be signed by both tenant and the owner along with two witnesses. And finally, once the rent agreement is ready, you have to register it at the Sub-Registrar office by paying the registration fees. But, if the lease term as per the agreement is 11 months or less, then the registration is not required. Short Term Lease – Properties rented for a short period of time or for 11 months is a Short Term Lease. It is taken for residential and business purposes. Based on it, a Short Term Rental Agreement is also of two types. Residential or 11-Month Lease – The 11-month agreement is done for residential purposes. The agreement can be renewed at the end of the term by both the parties here. Commercial Lease – Commercial Lease Agreement is created for business purposes. Mostly firms/ companies desirous of renting a property for business sign this type of agreement. Long Term Lease – The lease which is agreed upon for more than 5 years is a Long-term lease. Generally, in this type of lease, the owner charges sum which is worth the property itself. Name of the Parties – The names of the people living in the property should be specified as the landlord has the right to determine who will live on his property. Rental Duration – To mention the time period of a tenant living in the property, the duration or the term until which he can stay must be mentioned. After the term is over and the tenant is still living on the property without permission the landlord can charge extra. Security Deposit Amount – Before signing the Rental Agreement make sure that you have already negotiated your rental and the deposit fees. After the negotiation is done, include the amount of rent to be paid monthly and the deposit fees that you have agreed to pay. Penalty – If a tenant delays the payment of rent, the owner can charge for the delay which is necessary to be included in the agreement. Overstay – The owner should be specific about how long is he going to let the tenant stay and what is he going to do if the tenant stays longer than the term of the agreement. Pets – It is also important to mention pets in the draft as many of the landlords might restrict keeping pets on their property. What and how many pets are to be allowed should be clearly specified. Food Habits – The owner might have different food in his home i.e. veg or non-veg. This can also be mentioned in the agreement for clear understanding. Maintenance Fees – Besides rental fees and deposit, the payment for garbage disposal, regular cleaning and security are also to be included. Nowadays, there are many platforms that might offer you fake service and cannot be trusted. So, it is best that you make the agreements with us as our platform is utterly trustworthy with thousands of satisfied users. 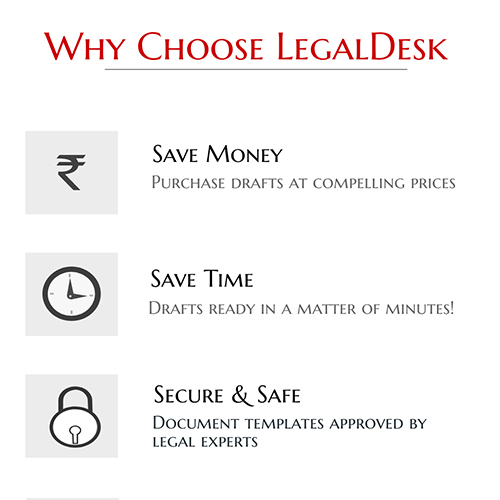 The traditional agreement required lawyers to draft, but now, with LegalDesk.com, you can simply create your own Rental Agreement online and by staying at your home. All one needs to do is open the Rental Agreement Form in LegalDesk.com by clicking the button below and fill the details of the landlord, tenant and the property being rented. Download the agreement and get it printed on a stamp paper of requisite value. Apart from Rental Agreement, there are many important ready to use legal documents that you may require for your personal and professional use. Our platform provides a perfect and extremely convenient service along with the printing your documents on stamp papers and delivering them to your doorstep. Security will not be an issue here at all as we have lawyer verified affidavits, and legal documents including Will, Power of Attorney etc. There are 0 comments on "Andaman and Nicobar Islands: Create Your Rental Agreement Online".